Ship Design. In (I), players researched technology which gave them access to new ships. In (II), players research technology and then use that technology to design their own ship classes. So instead of having a "Battle Cruiser" and a "Dreadnought" players instead come up with their own ideas. The user will also be able to literally visually design much of how their ship looks. Unique Planets. In (I) there were 26 different planets. The higher the planet class, the better. Simply colonizing the planet automatically gave the player all kinds of benefits. In (II) each planet will be unique -- visually and while they will still have planet classes (1 through 30) that will determine the amount of usable land on the planet to build on. Players will have pick and choose what they use their planets for. Moreover, some planets will be rich in minerals, others may have ruins filled with precursor technology. New Map System. In (I) the sector map was filled with stars. A player would click on a star and a planet list would be displayed. 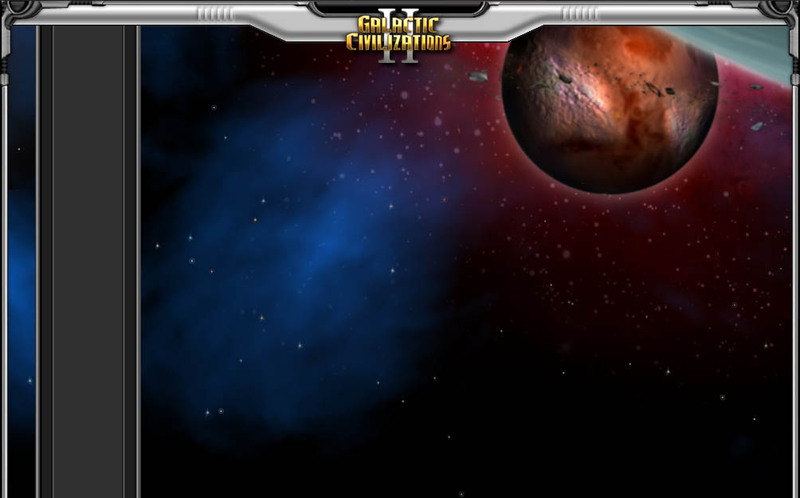 Then the player would click on the planet to interact with it. In (II) the planets are part of the map. That means different players can share the same star system. That also means player influence is planet based instead of sector based. Moreover, asteroid fields and other interstellar objects can now be placed on the map to be made use of. Play as any race. In (I) players had to play as humans. In (II) the player can pick any of the 10 alien races (including humans) to play as. Each race will have its own unique advantages and disadvantages. On top of that, players will be able to create their own unique races and play as that in the event that they want a truly custom civilization. 3D Engine. In (I) the game engine was sprite based. This allowed it to run on very low end graphics cards as long as they had at least a Pentium II 600Mhz machine. In (II) it has a 3D engine which will deliver vastly superior visuals than the first one. It also means that players with relatively low end hardware (Pentium II 400Mhz or better) can play it as long as they have a decent video card (Geforce 2 or better type card). Moreover, the game's 3D models will automatically scale based on how powerful your video card is. So the graphics will actually get better automatically over the years. Stardock's hope is that people will still be playing this game many years from now. Resolution Independent. Resolution was fixed to 1024x768 in (I) but in (II) players can play at any resolution from 1024x768 on up. And it's not lame about it, the system makes use of Stardock's DesktopX technology that no other company at the time of this writing employs. What it means is that the user interface and other elements of the game can be expanded seamlessly even where sprites are used (other games that have flexible interfaces have to render them on the fly as 3D which limits how complex they can be). Fleets. In (I) players could stack together ships and move them. Stacks of ships will still be there as a convenience but (II) will also have real fleets that will taken advantage of in combat. Fleet size will be limited by the player's logistic ability. So one of the many technological paths will be focusing on logistics. Big fleets of small ships or a few capital ships in a massive fire fight? Players will have that ability to choose those kinds of strategies. Enhanced Combat System. In (I) ships had a simple attack and defense value. In (II) ships will have 3 types of attack (beam weapons, mass drivers, and missile weapons) and 3 types of defense (shields, armor, and point defense). Different players and races will focus on different types of weapons and defenses. Shields counter act beam weapons but are useless against mass drivers. So now players will have to do a great deal more strategic planning on wars. Non-Linear Campaign. (I) didn't include a campaign, the expansion pack, Altarian Prophecy added one. (II) includes a campaign and it is non-linear. That means players can lose a mission and continue forward in the story but it will take an alternative route. Better Game Start-Up Options. (I) was always free for all on a random map. Altarian Prophecy provided some additional options. (II) will have both random maps and pre-made maps. Free for all games will still be there but so will team games and eternal enemy options. Top-Notch AI. (I) was known for good computer players. But (II) will have even better AI. More types of Star Bases. (I) had one type of starbase. (II) will break it up into several different types of star bases with their own improvement trees. Cleaner Technology "tree". (I) had a fairly complicated technology tree. (II) will have a much more linear technology tree with the focus being on different categories of technology (Weapons, propulsion, economics, culture, etc.). You can read more information on the game using the detailed Information Guide.